Gideon is found western Black Marsh, near the border towards Cyrodiil. Some sources claim that Gideon is located within the region of Murkmire, although this is incorrect as Murkmire is located far to the south. [nb 1] Gideon is situated near the Onkobra River, a fast-running stream that eventually leads into the dark center of Black Marsh. Surrounding Gideon is various plantations ruled by Archeins, that form around the Topal Bay and the Onkobra River, as well as pockets of red clay. The plantations are largely unsuccessful, devolved into wilted vines, and desolate orchards of lifeless trees. 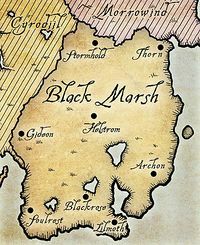 The marshlands around Gideon, and overall Black Marsh make it seemingly impossible to have a stable settlement. Villages would occasionally float towards Gideon's gate, taking as long as a month. Before the Knahaten Flu in 2E 560, the region around Gideon was originally occupied by the Kothringi. In Gideon was an active Temple of Dibella. Gideon's architecture and layout is in the tradition Imperial style, which makes sense considering the Imperial occupation. The streets are cramped and labyrinthine. Not far from Gideon is Castle Giovesse, which was used as a prison for Empress Tavia in the very-late First Era. The road between Gideon and the castle is flooded come springtide. Like Stormhold, the city-state of Gideon was built atop of an old Ayleid settlement, whose name has been forgotten. Gideon is neighbored by several settlements, including Glenbridge in the northeast, and Stonewastes in the southeast. Gideon's roots date back to the time of the Ayleids. In the aftermath of the Narfinsel Schism, the Barsaebic Ayleids had fled to the marshes of Black Marsh after being driven out by the Daedraphiles of Cyrodiil. One of these Ayleid groups settled on the site of modern-day Gideon. The name of the settlement is long forgotten. The Ayleid settlement was active during the Alessian Slave Rebellion, which started in 1E 242. When King Glinferen of Atatar sought help from the Barsaebic King of Old Gideon against the rebels, the envoy was sent back with a blunt "no." Fortunately for the Barsaebic Ayleids, the Slave Rebellion did not reach them, they were very far removed from the Imperial Province. At one point or the other, the Argonians took refuge in Gideon. The Blackwater War, conducted by the Second Empire, had occurred throughout Argonia. During the second campaign, under Imperial General Regulus Sardecus, there was an incident known as the Great Burn, occurring in 1E 2828. One of Sardecus' legates had ordered her soldiers to burn a peat bog near Stormhold, however, this small bog was connected to a large underground network that stretched across the province. Raging fires would occur as far as Gideon and Soulrest. With this incident, the second campaign was over and a new strategy was needed to conquer Argonia. General Lucinia Falco had taken control of the Imperial Legion, devising another strategy that would consist of various battles, in various war fronts, unlike the straightforward strategies seen in the past. Falco had used Gideon as her headquarters, sending out expeditionary platoons that eventually took control of Western Black Marsh. In 1E 2837, the Blackwater War was over, and the Imperial Province of Black Marsh was founded. Sometime after the Blackwater War, Gideon had become the modern-day Imperialized settlement it is today. In 1E 2899, Empress Tavia was imprisoned at Castle Giovesse in Gideon, for suspected treason. Tavia had spent time in Castle Giovesse for roughly twenty-one years, kept out of the blue from the outside occurrences. The only contact she had was through Zuuk, a Kothringi tribesman that served as her personal Imperial Knight. It was at the Sow and Vulture Inn in Gideon, Zuuk, at the request of Empress Tavia, commissioned the assassination of Emperor Reman III. However, this would inadvertently lead to the death of her son, Juilek Cyrodiil. Her screams of grief echoed through the halls of Castle Giovesse. Ultimately, on the 6th of Hearthfire, Tavia had taken her life in Castle Giovesse. Sometime during the Second Era, Gideon was ruled by a Vicecanon. After serving her time in the Three Banners War, the Argonian war hero, Keshu the Black Fin had returned to Black Marsh, and took refuge in Gideon, along with her entourage. She planned to establish an inviting and vibrant form of modern Argonian society. It had involved using the information and discoveries gained from her travels across the Ebonheart Pact, and re-discover the past Argonian civilization that was lost from Duskfall, without changing their modern culture. It is unknown whether Gideon was a part of the Ebonheart Pact. At around the same time, Councilor Vandacia resided in Gideon, refusing to meet with the rest of the Elder Council. He instead opted to stay in Gideon, believing that he was at an effective spot to deal with the Iron crisis at the Nibenay Basin. In 2E 582, the cities of Gideon and Leyawiin had made trade agreements, which would result in traffic between both cities. The former Kothringi lands would be re-opened to preserve the trade. During the Imperial Simulacrum in the late Third Era, the city-state of Gideon was an active settlement, being ruled by Queen Demia. It had a rivalry with Soulrest. At the time, Gideon was known as the Black City of Seth, whose brotherhood has chapters across Tamriel. They have a notable temple in Camlorn. The city was overrun by the undead army of Umbriel circa 4E 40, despite not being beneath Umbriel's shadow. This destruction was considered light compared to locations that fell within the floating city's path. ^ The reason for this discrepancy is due to the fact that the Murkmire zone in ESO was originally going to be located in western Black Marsh, adjacent to Shadowfen and encompassing the city of Gideon. The zone was delayed and redesigned, resulting in Murkmire being moved to southern Black Marsh and Lilmoth replacing Gideon as the region's main settlement. This page was last modified on 22 January 2019, at 22:19.